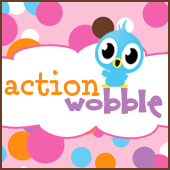 Hello Everyone it is me Gloria from Girlia's Cards again with an action wobble card. I think this one is just perfect for Valentine's day. Thanks again for joining me today to view this card...I am really excited about this card because it is my first easel card...Can you believe out of all the card bases that I've done I have never done an easel card? I am glad how it turned out, and that is one card base I can now officially cross off the list (lol). OMGoodness, isn't he just a doll, super cute!